Caroline Bradlee Designs > HOLIDAYS > 4TH OF JULY & PATRIOTIC > Boy's Patriotic 4th Of July Flag Initial Shorts Set. 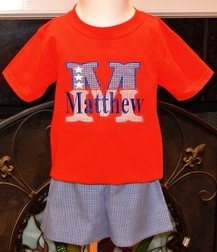 Such a sweet outfit for your little one to show his patriotism all throughout the year and especially for Memorial Day and the 4th of July parties and get togethers. We start the outfit with a red cotton shirt and applique it with the first letter of your little one's name. 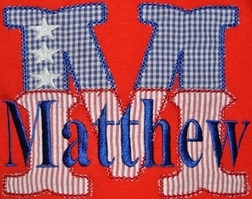 The applique is made with royal blue gingham and red stripe seersucker to resemble the Flag. White stars are embroidered in the top left of the applique. 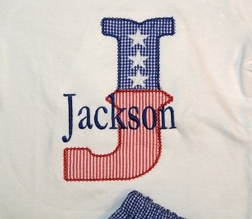 The name is embroidered across the applique in royal blue to match the gingham. 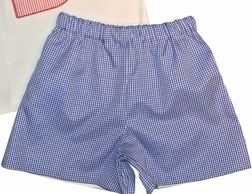 The shirt is paired with royal blue gingham shorts to coordinate with the applique.